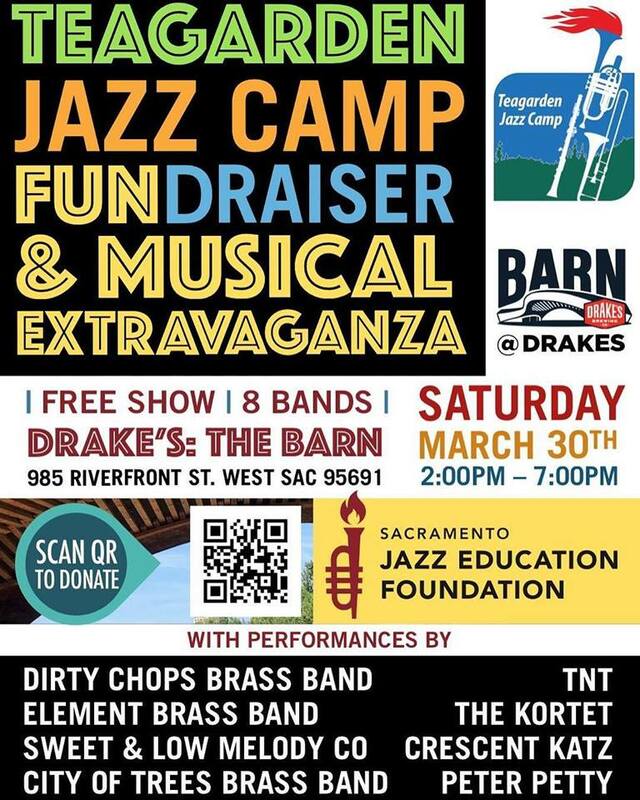 West Sacramento, CA — On Saturday, March 30th, over 50 jazz musicians comprising eight local bands will gather on the banks of the American River for this year’s Teagarden Jazz Camp Fundraising Extravaganza. 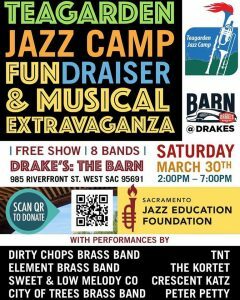 The four-hour show, held from 2 to 6 p.m. at Drake’s: The Barn, will feature headliners Element Brass Band and Peter Petty—both Sammie award winning acts—plus an assortment of brass bands, swing bands and New Orleans-style hot jazz ensembles to help send deserving students to the Teagarden summer jazz camp.  There is no cover charge, but a suggested $20-per-person donation will help bring the gift of jazz to budding young musicians. As the world’s oldest musical camp focusing specifically on early jazz, Teagarden has a long list of celebrity alumni from pop star Carly Rae Jepsen to jazz singer and trumpeter Bria Skonberg. Camp instructors are themselves highly accomplished musicians who have played with some of the biggest names around the world. In Sacramento, it’s hard to find a jazz band that does not have at least one or two musicians who have taken part in the Teagarden camp as either an instructor, a one-time student, or both. Saturday, March 30, 2–6 p.m.
o Sweet &amp; Low Melody Co. Since 1986, the Teagarden Jazz Camp has been helping young musicians sharpen their skills under the tutelage of experienced musicians. Students aged 12–20 camp each year at Sly Park in Pollock Pines to learn the fundamentals of early jazz and improvisation techniques in an intensive week-long program, culminating with a concert on the final day in Sacramento. More at sacjazzcamp.org.